NIC + ZOE "Feel Good" luxurious, soft-knit pants. Pleated, wide legs fall from hips. Alice + Olivia "Jalisa" pants with center seam. Approx. measurements: 10.3" front rise; 14.1" back rise; 35" inseam. High-rise; flat front. Hidden side zip. Fitted through thighs. Flared legs. Polyester. Lining, polyester/spandex. Imported. Model's measurements: Height 5'10"/177cm, bust 31"/79cm, waist 24"/61cm, hips 34"/86cm, dress size US 2. Diane von Furstenberg "Erica" printed stretch pants. High-rise; flat front. Side slip pockets. Fitted through wide legs. Full length. Back zip. Viscose/spandex. Imported. Model's measurements: Height 5'11"/180cm, bust 32"/81cm, waist 25"/64cm, hips 35.5"/90cm, dress size US 0/2. 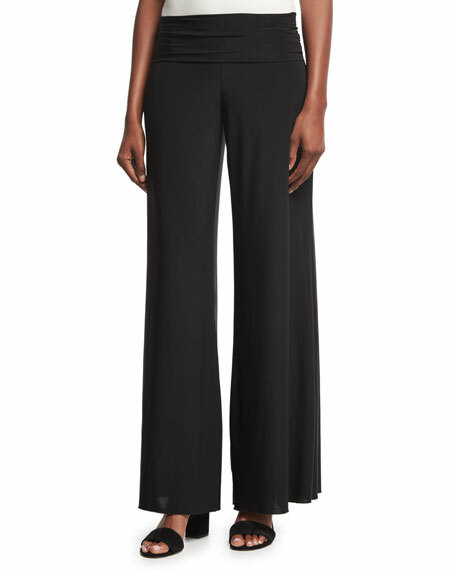 Halston Heritage pants in solid stretch-wool. Side slip pockets. Sits at natural waist. Straight, wide legs. Hidden hook/zip front. Viscose/wool/spandex. 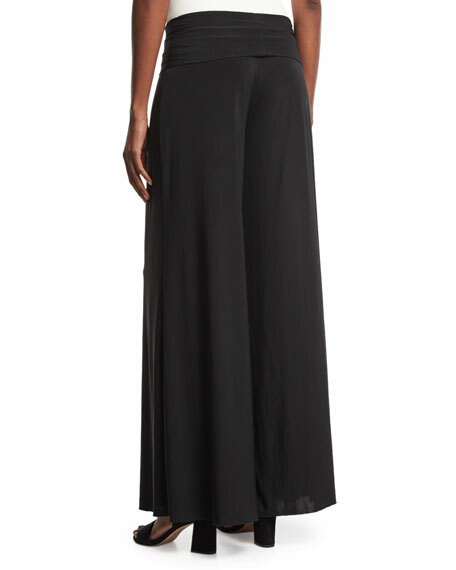 Halston Heritage pants in solid stretch-wool. Side slip pockets. Sits at natural waist. Straight, wide legs. Hidden hook/zip front. Viscose/wool/spandex. Dry clean. Imported. Model's measurements: Height 5'11"/180cm, bust 33"/84cm, waist 24.5"/62cm, hips 34"/86cm, dress size US 2.